An Amazon List is an object that displays a list of one or more Amazon products. There are a wide range of layout options available. Visitors can click on a product to view, and then purchase it. Write a review of a product you've recently acquired and use an Amazon List to point visitors to it for their own purchase. Make some money by encouraging your site visitors to purchase items via your links to Amazon. Click the "Objects" item in the toolbar and select "Amazon List." Click the flag icon to select the store most appropriate for your site. Now you need to add some Amazon products to the list. URL - use your web browser to view a product on Amazon's website and then copy its address. ASIN - every product in Amazon's catalog has an ASIN code which uniquely identifies it. This is listed among the product's details on Amazon's website. ISBN - all books have an ISBN code on their reverse. Alternatively, you can drag the URL of (or a link to) an Amazon product into the table from your web browser. Repeat step 2 for each product. If you wish, enter a comment about the product in the "Comment" field under the table. Congratulations! 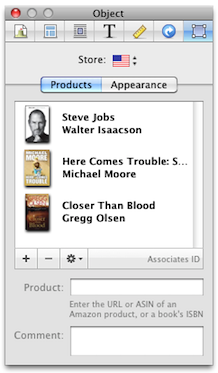 You should now have an Amazon List object set up with one or more products. If you are a member of Amazon Associates you can specify your associates ID in the inspector, at the bottom of the list products. You can customize how the list appears. 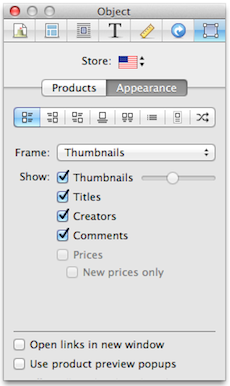 Click the "Appearance" tab in the Inspector. Thumbnails and text aligned to the left-hand side of the object. Thumbnails and text aligned to the right-hand side of the object. Products are aligned in an alternating pattern. Everything is centered down the middle of the object and the thumbnail size is adjustable. Products are arranged in a grid, two across the width of the object. A simple bulleted list with no thumbnails. Products are displayed in Amazon's standard "advertisement" style. Similar to the previous layout, but only a single box is shown. A random product from the list appears each time the page is refreshed. Note that some options may be disabled depending on how you have set the rest of the object setup. In particular, are using any of first six layout styles. Links are opened in a separate browser window. Check the box and when visitors hover over an item in the list for a moment, the full product details will "pop up" over the page. This option is only available for the US store and will only appear on the published site; not within Sandvox itself. Also, if you have more than one Amazon List in your site and check the box for one, it may effectively enable it for the other object.